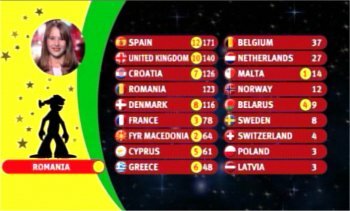 For all those people who are interested in the Junior Eurovision Song Contest, here are the results and details for 2004. Strange that it is the same 3 countries who finished top in 2003 but in a different order!. The second Junior Eurovision Song Contest took place at the Håkons Hall, Lillehammer, Norway on Saturday 20 November 2004. The contest last just over 2 1/4 hours. Nadia Hasnaoui and Stian Barsnes Simonsen hosted this event. Westlife performed on the night as the interview act. 18 Countries took part. They are in performance order (drawn on 14 October 2004), Greece, Malta, The Netherlands, Switzerland, Norway, France, Former Yugoslav Republic of Macedonia, Poland, Cyprus, Belarus, Croatia, Latvia, United Kingdom, Denmark, Spain, Sweden, Belgium, Romania. The winner was decided by televoting, as like the main Eurovision Song Contest. The 2005 host will not be the winner of the Junior 2004 contest. The host for 2005 Junior Eurovision Song Contest will be held in Belgium on Saturday 26 November 2005. Here are the songs and artist who entered the 2004 Junior Eurovision Song Contest and their final score. 14 Belarus 9 Spjavajtse so mnoj (Sing with me) Yahor Volchek 10 ?? 16 Switzerland 4 Birichino (Cheeky) Demiss Mirarchi 4 ?? UK Final was broadcast on Saturday 4 September 2004 and shown on ITV2, as there was not enough viewers last year on ITV1. Shown at 18:35 - 19:35. Results at 21:45 - 22:15.